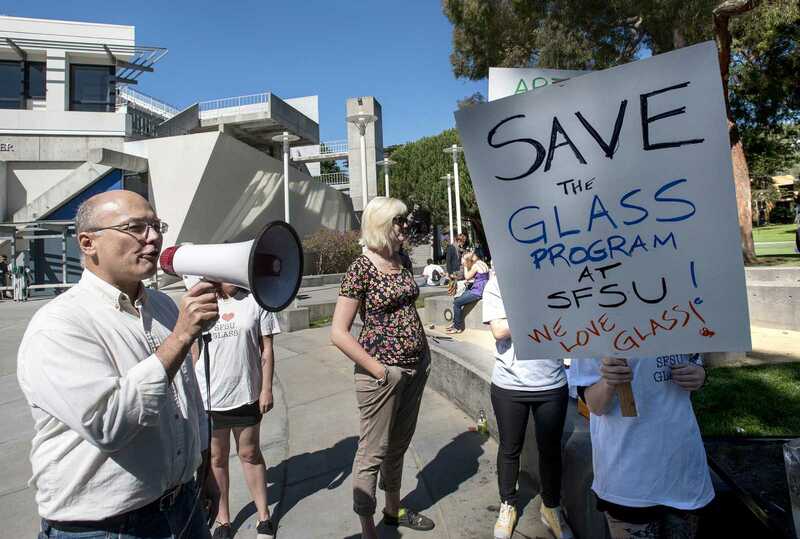 Students and arts department alumni protested the cancelation of glass class at Malcolm X Plaza this afternoon. Though not a big crowd, the 15 students with signs chanted slogans and asked passersby to sign their petition. SF State’s College of Extended Learning glass blowing class, created in 1972, is the third oldest continuous glass program in the US. Three weeks ago, College of Liberal and Creative Arts Dean Paul Sherwin told Instructor Nate Watson the class will be terminated at the end of Fall 2013. Sherwin reasoned the decision was made because the department needs more classrooms, the class has low enrollment of art majors and has high materials’ fees for students which cannot be covered by financial aid. Although the class is expensive — $993 for the class, $298 for materials — it is popular and over-enrolled. “This is exactly the kind of thing that the CEL is for, so that professionals and students can take a class in something different,” said Porkola, an exhibit tech at the Exploratorium, who has taken glass blowing at SF State for eight years. The protestors want 1,000 names on their petition, but several conceded that it’s unlikely the University will change its plans for the cancelled class. Sarah Band, an Arts Major graduate said she wants recognition for the glass arts and art department at SF State. “Ultimately, it would be great if we would keep the class open,” said Band. The SF State graduate has taken glass blowing for three years, and now puts her work in shows. “This is not an easy decision. But since 2008, 168 students have taken glass blowing class, 47 of those are matriculated students, and only 5 of them are art majors. We are in the business of educating students and granting degrees, it’s not an easy decision, but it was a carefully weighed decision, ” said Associate Dean of the College of Liberal and Creative Arts Todd Roehrman. Students interested in learning glass blowing will have to go to California College of the Arts, which has campuses in Oakland and San Francisco, said Band. “But it’s a blow to the art department and what art means at this school,” said Band.